For other uses, see Sea (disambiguation) and The Sea (disambiguation). Not to be confused with Ocean or World Ocean. The sea, the world ocean or simply the ocean is the connected body of salty water that covers over 70 percent of the Earth's surface. It moderates the Earth's climate and has important roles in the water cycle, carbon cycle, and nitrogen cycle. It has been travelled and explored since ancient times, while the scientific study of the sea—oceanography—dates broadly from the voyages of Captain James Cook to explore the Pacific Ocean between 1768 and 1779. The word "sea" is also used to denote smaller, partly landlocked sections of the ocean and certain large, entirely landlocked, saltwater lakes such as the Caspian Sea and the Dead Sea. A wide variety of organisms, including bacteria, protists, algae, plants, fungi and animals, live in the sea, which offers a wide range of marine habitats and ecosystems, ranging vertically from the sunlit surface waters and the shoreline to the enormous depths and pressures of the cold, dark abyssal zone, and in latitude from the cold waters under the Arctic ice to the colourful diversity of coral reefs in tropical regions. Many of the major groups of organisms evolved in the sea and life may have started there. The sea provides substantial supplies of food for humans, mainly fish, but also shellfish, mammals and seaweed, whether caught by fishermen or farmed underwater. Other human uses of the sea include trade, travel, mineral extraction, power generation, warfare, and leisure activities such as swimming, sailing, and scuba diving. Many of these activities create marine pollution. The sea is important in human culture, with major appearances in literature at least since Homer's Odyssey, in marine art, in cinema, in theatre and in classical music. Symbolically, the sea appears as monsters such as Scylla in mythology and represents the unconscious mind in dream interpretation. The scientific study of water and Earth's water cycle is hydrology; hydrodynamics studies the physics of water in motion. The more recent study of the sea in particular is oceanography. This began as the study of the shape of the ocean's currents but has since expanded into a large and multidisciplinary field: it examines the properties of seawater; studies waves, tides, and currents; charts coastlines and maps the seabeds; and studies marine life. The subfield dealing with the sea's motion, its forces, and the forces acting upon it is known as physical oceanography. Marine biology (biological oceanography) studies the plants, animals, and other organisms inhabiting marine ecosystems. Both are informed by chemical oceanography, which studies the behavior of elements and molecules within the oceans: particularly, at the moment, the ocean's role in the carbon cycle and carbon dioxide's role in the increasing acidification of seawater. Marine and maritime geography charts the shape and shaping of the sea, while marine geology (geological oceanography) has provided evidence of continental drift and the composition and structure of the Earth, clarified the process of sedimentation, and assisted the study of volcanism and earthquakes. The water in the sea was thought to come from the Earth's volcanoes, starting 4 billion years ago, released by degassing from molten rock. (pp24–25) More recent work suggests much of the Earth's water may come from comets. A characteristic of seawater is that it is salty. Salinity is usually measured in parts per thousand (‰ or per mil), and the open ocean has about 35 grams (1.2 oz) solids per litre, a salinity of 35 ‰. The Mediterranean Sea is slightly higher at 38 ‰, while the salinity of the northern Red Sea can reach 41‰. The constituents of table salt, sodium and chloride, make up about 85 percent of the solids in solution, there are also other metal ions such as magnesium and calcium and negative ions including sulphate, carbonate, and bromide. Despite variations in the levels of salinity in different seas, the relative composition of the dissolved salts is stable throughout the world's oceans. Seawater is too saline for humans to drink safely, as the kidneys cannot excrete urine as salty as seawater. In contrast, some landlocked hypersaline lakes have a much higher salinity, for example the Dead Sea has 300 grams (11 oz) dissolved solids per litre (300 ‰). Although the amount of salt in the ocean remains relatively constant within the scale of millions of years, various factors affect the salinity of a body of water. Evaporation and by-product of ice formation (known as "brine rejection") increase salinity, whereas precipitation, sea ice melt, and runoff from land reduce it. The Baltic Sea, for example, has many rivers flowing into it, and thus the sea could be considered as brackish. Meanwhile, the Red Sea is very salty due to its high evaporation rate. Sea temperature depends on the amount of solar radiation falling on its surface. In the tropics, with the sun nearly overhead, the temperature of the surface layers can rise to over 30 °C (86 °F) while near the poles the temperature in equilibrium with the sea ice is about −2 °C (28 °F). There is a continuous circulation of water in the oceans. Warm surface currents cool as they move away from the tropics, and the water becomes denser and sinks. The cold water moves back towards the equator as a deep sea current, driven by changes in the temperature and density of the water, before eventually welling up again towards the surface. Deep seawater has a temperature between −2 °C (28 °F) and 5 °C (41 °F) in all parts of the globe. Seawater with a typical salinity of 35‰ has a freezing point of about −1.8 °C (28.8 °F). When its temperature becomes low enough, ice crystals form on the surface. These break into small pieces and coalesce into flat discs that form a thick suspension known as frazil. In calm conditions this freezes into a thin flat sheet known as nilas, which thickens as new ice forms on its underside. In more turbulent seas, frazil crystals join together into flat discs known as pancakes. These slide under each other and coalesce to form floes. In the process of freezing, salt water and air are trapped between the ice crystals. Nilas may have a salinity of 12–15 ‰, but by the time the sea ice is one year old, this falls to 4–6 ‰. The amount of oxygen found in seawater depends primarily on the plants growing in it. These are mainly algae, including phytoplankton, with some vascular plants such as seagrasses. In daylight the photosynthetic activity of these plants produces oxygen, which dissolves in the seawater and is used by marine animals. At night, photosynthesis stops, and the amount of dissolved oxygen declines. In the deep sea, where insufficient light penetrates for plants to grow, there is very little dissolved oxygen. In its absence, organic material is broken down by anaerobic bacteria producing hydrogen sulphide. Global warming is likely to reduce levels of oxygen in surface waters, since the solubility of oxygen in water falls at higher temperatures. The amount of light that penetrates the sea depends on the angle of the sun, the weather conditions and the turbidity of the water. Much light gets reflected at the surface, and red light gets absorbed in the top few metres. Yellow and green light reach greater depths, and blue and violet light may penetrate as deep as 1,000 metres (3,300 ft). There is insufficient light for photosynthesis and plant growth beyond a depth of about 200 metres (660 ft). Wind blowing over the surface of a body of water forms waves that are perpendicular to the direction of the wind. The friction between air and water caused by a gentle breeze on a pond causes ripples to form. A strong blow over the ocean causes larger waves as the moving air pushes against the raised ridges of water. The waves reach their maximum height when the rate at which they are travelling nearly matches the speed of the wind. In open water, when the wind blows continuously as happens in the Southern Hemisphere in the Roaring Forties, long, organised masses of water called swell roll across the ocean. (pp83–84)[d] If the wind dies down, the wave formation is reduced, but already-formed waves continue to travel in their original direction until they meet land. The size of the waves depends on the fetch, the distance that the wind has blown over the water and the strength and duration of that wind. When waves meet others coming from different directions, interference between the two can produce broken, irregular seas. Constructive interference can cause individual (unexpected) rogue waves much higher than normal. Most waves are less than 3 m (10 ft) high and it is not unusual for strong storms to double or triple that height; offshore construction such as wind farms and oil platforms use metocean statistics from measurements in computing the wave forces (due to for instance the hundred-year wave) they are designed against. Rogue waves, however, have been documented at heights above 25 meters (82 ft). The top of a wave is known as the crest, the lowest point between waves is the trough and the distance between the crests is the wavelength. The wave is pushed across the surface of the sea by the wind, but this represents a transfer of energy and not a horizontal movement of water. As waves approach land and move into shallow water, they change their behavior. If approaching at an angle, waves may bend (refraction) or wrap rocks and headlands (diffraction). When the wave reaches a point where its deepest oscillations of the water contact the seabed, they begin to slow down. This pulls the crests closer together and increases the waves' height, which is called wave shoaling. 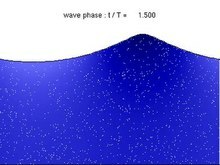 When the ratio of the wave's height to the water depth increases above a certain limit, it "breaks", toppling over in a mass of foaming water. This rushes in a sheet up the beach before retreating into the sea under the influence of gravity. A tsunami is an unusual form of wave caused by an infrequent powerful event such as an underwater earthquake or landslide, a meteorite impact, a volcanic eruption or a collapse of land into the sea. These events can temporarily lift or lower the surface of the sea in the affected area, usually by a few feet. The potential energy of the displaced seawater is turned into kinetic energy, creating a shallow wave, a tsunami, radiating outwards at a velocity proportional to the square root of the depth of the water and which therefore travels much faster in the open ocean than on a continental shelf. In the deep open sea, tsunamis have wavelengths of around 80 to 300 miles (130 to 480 km), travel at speeds of over 600 miles per hour (970 km/hr) and usually have a height of less than three feet, so they often pass unnoticed at this stage. In contrast, ocean surface waves caused by winds have wavelengths of a few hundred feet, travel at up to 65 miles per hour (105 km/h) and are up to 45 feet (14 metres) high. A trigger event on the continental shelf may cause a local tsunami on the land side and a distant tsunami that travels out across the ocean. The energy of the wave is dissipated only gradually, but is spread out over the wave front, so as the wave radiates away from the source, the front gets longer and the average energy reduces, so distant shores will, on average, be hit by weaker waves. However, as the speed of the wave is controlled by the water depth, it does not travel at the same speed in all directions, and this affects the direction of the wave front - an effect known as refraction - which can focus the strength of the advancing tsunami on some areas and weaken it in others according to undersea topography. As a tsunami moves into shallower water its speed decreases, its wavelength shortens and its amplitude increases enormously, behaving in the same way as a wind-generated wave in shallow water, but on a vastly greater scale. Either the trough or the crest of a tsunami can arrive at the coast first. In the former case, the sea draws back and leaves subtidal areas close to the shore exposed which provides a useful warning for people on land. When the crest arrives, it does not usually break but rushes inland, flooding all in its path. Much of the destruction may be caused by the flood water draining back into the sea after the tsunami has struck, dragging debris and people with it. Often several tsunami are caused by a single geological event and arrive at intervals of between eight minutes and two hours. The first wave to arrive on shore may not be the biggest or most destructive. 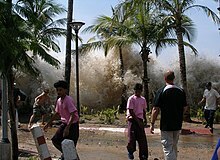 Occasionally, a tsunami may transform into a bore, typically in a shallow bay or an estuary. Wind blowing over the surface of the sea causes friction at the interface between air and sea. Not only does this cause waves to form but it also makes the surface seawater move in the same direction as the wind. Although winds are variable, in any one place they predominantly blow from a single direction and thus a surface current can be formed. Westerly winds are most frequent in the mid-latitudes while easterlies dominate the tropics. When water moves in this way, other water flows in to fill the gap and a circular movement of surface currents known as a gyre is formed. There are five main gyres in the world's oceans: two in the Pacific, two in the Atlantic and one in the Indian Ocean. Other smaller gyres are found in lesser seas and a single gyre flows around Antarctica. These gyres have followed the same routes for millennia, guided by the topography of the land, the wind direction and the Coriolis effect. The surface currents flow in a clockwise direction in the Northern Hemisphere and anticlockwise in the Southern Hemisphere. The water moving away from the equator is warm, and that flowing in the reverse direction has lost most of its heat. These currents tend to moderate the Earth's climate, cooling the equatorial region and warming regions at higher latitudes. Global climate and weather forecasts are powerfully affected by the world ocean, so global climate modelling makes use of ocean circulation models as well as models of other major components such as the atmosphere, land surfaces, aerosols and sea ice. Ocean models make use of a branch of physics, geophysical fluid dynamics, that describes the large-scale flow of fluids such as seawater. Surface currents only affect the top few hundred metres (yards) of the sea, but there are also large-scale flows in the ocean depths caused by the movement of deep water masses. 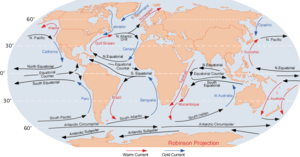 A main deep ocean current flows through all the world's oceans and is known as the thermohaline circulation or global conveyor belt. This movement is slow and is driven by differences in density of the water caused by variations in salinity and temperature. At high latitudes the water is chilled by the low atmospheric temperature and becomes saltier as sea ice crystallizes out. Both these factors make it denser, and the water sinks. From the deep sea near Greenland, such water flows southwards between the continental landmasses on either side of the Atlantic. When it reaches the Antarctic, it is joined by further masses of cold, sinking water and flows eastwards. It then splits into two streams that move northwards into the Indian and Pacific Oceans. Here it is gradually warmed, becomes less dense, rises towards the surface and loops back on itself. Some flows back into the Atlantic. It takes a thousand years for this circulation pattern to be completed. Besides gyres, there are temporary surface currents that occur under specific conditions. When waves meet a shore at an angle, a longshore current is created as water is pushed along parallel to the coastline. The water swirls up onto the beach at right angles to the approaching waves but drains away straight down the slope under the effect of gravity. The larger the breaking waves, the longer the beach and the more oblique the wave approach, the stronger is the longshore current. These currents can shift great volumes of sand or pebbles, create spits and make beaches disappear and water channels silt up. A rip current can occur when water piles up near the shore from advancing waves and is funnelled out to sea through a channel in the seabed. It may occur at a gap in a sandbar or near a man-made structure such as a groyne. These strong currents can have a velocity of 3 ft (0.9 m) per second, can form at different places at different stages of the tide and can carry away unwary bathers. Temporary upwelling currents occur when the wind pushes water away from the land and deeper water rises to replace it. This cold water is often rich in nutrients and creates blooms of phytoplankton and a great increase in the productivity of the sea. Tides are the regular rise and fall in water level experienced by seas and oceans in response to the gravitational influences of the Moon and the Sun, and the effects of the Earth's rotation. During each tidal cycle, at any given place the water rises to a maximum height known as "high tide" before ebbing away again to the minimum "low tide" level. As the water recedes, it uncovers more and more of the foreshore, also known as the intertidal zone. The difference in height between the high tide and low tide is known as the tidal range or tidal amplitude. Most places experience two high tides each day, occurring at intervals of about 12 hours and 25 minutes. This is half the 24 hours and 50 minute period that it takes for the Earth to make a complete revolution and return the Moon to its previous position relative to an observer. The Moon's mass is some 27 million times smaller than the Sun, but it is 400 times closer to the Earth. Tidal force or tide-raising force decreases rapidly with distance, so the moon has more than twice as great an effect on tides as the Sun. A bulge is formed in the ocean at the place where the Earth is closest to the Moon, because it is also where the effect of the Moon's gravity is stronger. On the opposite side of the Earth, the lunar force is at its weakest and this causes another bulge to form. As the Moon rotates around the Earth, so do these ocean bulges move around the Earth. The gravitational attraction of the Sun is also working on the seas, but its effect on tides is less powerful than that of the Moon, and when the Sun, Moon and Earth are all aligned (full moon and new moon), the combined effect results in the high "spring tides". In contrast, when the Sun is at 90° from the Moon as viewed from Earth, the combined gravitational effect on tides is less causing the lower "neap tides". Tidal flows of seawater are resisted by the water's inertia and can be affected by land masses. In places like the Gulf of Mexico where land constrains the movement of the bulges, only one set of tides may occur each day. Inshore from an island there may be a complex daily cycle with four high tides. The island straits at Chalkis on Euboea experience strong currents which abruptly switch direction, generally four times per day but up to 12 times per day when the moon and the sun are 90 degrees apart. Where there is a funnel-shaped bay or estuary, the tidal range can be magnified. The Bay of Fundy is the classic example of this and can experience spring tides of 15 m (49 ft). Although tides are regular and predictable, the height of high tides can be lowered by offshore winds and raised by onshore winds. The high pressure at the centre of an anticyclones pushes down on the water and is associated with abnormally low tides while low-pressure areas may cause extremely high tides. A storm surge can occur when high winds pile water up against the coast in a shallow area and this, coupled with a low pressure system, can raise the surface of the sea at high tide dramatically. In 1900, Galveston, Texas experienced a 15 ft (5 m) surge during a hurricane that overwhelmed the city, killing over 3,500 people and destroying 3,636 homes. The Earth is composed of a magnetic central core, a mostly liquid mantle and a hard rigid outer shell (or lithosphere), which is composed of the Earth's rocky crust and the deeper mostly solid outer layer of the mantle. On land the crust is known as the continental crust while under the sea it is known as the oceanic crust. The latter is composed of relatively dense basalt and is some five to ten kilometres (three to six miles) thick. The relatively thin lithosphere floats on the weaker and hotter mantle below and is fractured into a number of tectonic plates. 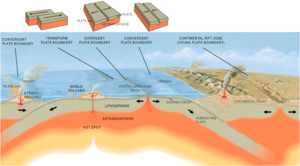 In mid-ocean, magma is constantly being thrust through the seabed between adjoining plates to form mid-oceanic ridges and here convection currents within the mantle tend to drive the two plates apart. Parallel to these ridges and nearer the coasts, one oceanic plate may slide beneath another oceanic plate in a process known as subduction. Deep trenches are formed here and the process is accompanied by friction as the plates grind together. The movement proceeds in jerks which cause earthquakes, heat is produced and magma is forced up creating underwater mountains, some of which may form chains of volcanic islands near to deep trenches. Near some of the boundaries between the land and sea, the slightly denser oceanic plates slide beneath the continental plates and more subduction trenches are formed. As they grate together, the continental plates are deformed and buckle causing mountain building and seismic activity. The Earth's deepest trench is the Mariana Trench which extends for about 2,500 kilometres (1,600 mi) across the seabed. It is near the Mariana Islands, a volcanic archipelago in the West Pacific, and though it averages just 68 kilometres (42 mi) wide, its deepest point is 10.994 kilometres (nearly 7 miles) below the surface of the sea. 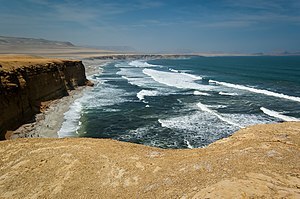 An even longer trench runs alongside the coast of Peru and Chile, reaching a depth of 8,065 metres (26,460 ft) and extending for approximately 5,900 kilometres (3,700 mi). It occurs where the oceanic Nazca Plate slides under the continental South American Plate and is associated with the upthrust and volcanic activity of the Andes. The zone where land meets sea is known as the coast and the part between the lowest spring tides and the upper limit reached by splashing waves is the shore. A beach is the accumulation of sand or shingle on the shore. A headland is a point of land jutting out into the sea and a larger promontory is known as a cape. The indentation of a coastline, especially between two headlands, is a bay, a small bay with a narrow inlet is a cove and a large bay may be referred to as a gulf. Coastlines are influenced by a number of factors including the strength of the waves arriving on the shore, the gradient of the land margin, the composition and hardness of the coastal rock, the inclination of the off-shore slope and the changes of the level of the land due to local uplift or submergence. Normally, waves roll towards the shore at the rate of six to eight per minute and these are known as constructive waves as they tend to move material up the beach and have little erosive effect. Storm waves arrive on shore in rapid succession and are known as destructive waves as the swash moves beach material seawards. Under their influence, the sand and shingle on the beach is ground together and abraded. Around high tide, the power of a storm wave impacting on the foot of a cliff has a shattering effect as air in cracks and crevices is compressed and then expands rapidly with release of pressure. At the same time, sand and pebbles have an erosive effect as they are thrown against the rocks. This tends to undercut the cliff, and normal weathering processes such as the action of frost follows, causing further destruction. Gradually, a wave-cut platform develops at the foot of the cliff and this has a protective effect, reducing further wave-erosion. Material worn from the margins of the land eventually ends up in the sea. Here it is subject to attrition as currents flowing parallel to the coast scour out channels and transport sand and pebbles away from their place of origin. Sediment carried to the sea by rivers settles on the seabed causing deltas to form in estuaries. All these materials move back and forth under the influence of waves, tides and currents. Dredging removes material and deepens channels but may have unexpected effects elsewhere on the coastline. Governments make efforts to prevent flooding of the land by the building of breakwaters, seawalls, dykes and levees and other sea defences. For instance, the Thames Barrier is designed to protect London from a storm surge, while the failure of the dykes and levees around New Orleans during Hurricane Katrina created a humanitarian crisis in the United States. Land reclamation in Hong Kong also permitted the construction of Hong Kong International Airport through the leveling and expansion of two smaller islands. Over most of geologic time, the sea level has been higher than it is today. (p74) The main factor affecting sea level over time is the result of changes in the oceanic crust, with a downward trend expected to continue in the very long term. At the last glacial maximum, some 20,000 years ago, the sea level was 120 metres (390 ft) below its present-day level. For at least the last 100 years, sea level has been rising at an average rate of about 1.8 millimetres (0.071 in) per year. Most of this rise can be attributed to an increase in the temperature of the sea and the resulting slight thermal expansion of the upper 500 metres (1,600 ft) of water. Additional contributions, as much as one quarter of the total, come from water sources on land, such as melting snow and glaciers and extraction of groundwater for irrigation and other agricultural and human needs. The rising trend from global warming is expected to continue until at least the end of the 21st century. The sea plays a part in the water or hydrological cycle, in which water evaporates from the ocean, travels through the atmosphere as vapour, condenses, falls as rain or snow, thereby sustaining life on land, and largely returns to the sea. Even in the Atacama Desert, where little rain ever falls, dense clouds of fog known as the camanchaca blow in from the sea and support plant life. In central Asia and other large land masses, there are endorheic basins which have no outlet to the sea, separated from the ocean by mountains or other natural geologic features that prevent the water draining away. The Caspian Sea is the largest one of these. Its main inflow is from the River Volga, there is no outflow and the evaporation of water makes it saline as dissolved minerals accumulate. The Aral Sea and Pyramid Lake in the western United States are further examples of large, inland saline water-bodies without drainage. Some endorheic lakes are less salty, but all are sensitive to variations in the quality of the inflowing water. Oceans contain the greatest quantity of actively cycled carbon in the world and are second only to the lithosphere in the amount of carbon they store. The oceans' surface layer holds large amounts of dissolved organic carbon that is exchanged rapidly with the atmosphere. The deep layer's concentration of dissolved inorganic carbon is about 15 percent higher than that of the surface layer and it remains there for much longer periods of time. Thermohaline circulation exchanges carbon between these two layers. It can also enter through rivers as dissolved organic carbon and is converted by photosynthetic organisms into organic carbon. This can either be exchanged throughout the food chain or precipitated into the deeper, more carbon rich layers as dead soft tissue or in shells and bones as calcium carbonate. It circulates in this layer for long periods of time before either being deposited as sediment or being returned to surface waters through thermohaline circulation. One important element for the formation of skeletal material in marine animals is calcium, but calcium carbonate becomes more soluble with pressure, so carbonate shells and skeletons dissolve below its compensation depth. Calcium carbonate also becomes more soluble at lower pH, so ocean acidification is likely to have profound effects on marine organisms with calcareous shells, such as oysters, clams, sea urchins, and corals, because their ability to form shells will be reduced, and the carbonate compensation depth will rise closer to the sea surface. Affected planktonic organisms will include the snail-like molluscs known as pteropods, and single-celled algae called coccolithophorids and foraminifera. All of these are important parts of the food chain and a diminution in their numbers will have significant consequences. In tropical regions, corals are likely to be severely affected as it becomes more difficult to build their calcium carbonate skeletons, in turn adversely impacting other reef dwellers. The current rate of ocean chemistry change appears to be without precedent in Earth's geological history, making it unclear how well marine ecosystems will be able to adapt to the shifting conditions of the near future. Of particular concern is the manner in which the combination of acidification with the expected additional stressors of higher temperatures and lower oxygen levels will impact the seas. Coral reefs are among the most biodiverse habitats in the world. Marine primary producers — plants and microscopic organisms in the plankton — are widespread and very essential for the ecosystem. It has been estimated that half of the world's oxygen is produced by phytoplankton. About 45 percent of the sea's primary production of living material is contributed by diatoms. Much larger algae, commonly known as seaweeds, are important locally; Sargassum forms floating drifts, while kelp form seabed forests. (pp246–255) Flowering plants in the form of seagrasses grow in "meadows" in sandy shallows, mangroves line the coast in tropical and subtropical regions and salt-tolerant plants thrive in regularly inundated salt marshes. All of these habitats are able to sequester large quantities of carbon and support a biodiverse range of larger and smaller animal life. There is a broader spectrum of higher animal taxa in the sea than on land, many marine species have yet to be discovered and the number known to science is expanding annually. Some vertebrates such as seabirds, seals and sea turtles return to the land to breed but fish, cetaceans and sea snakes have a completely aquatic lifestyle and many invertebrate phyla are entirely marine. In fact, the oceans teem with life and provide many varying microhabitats. One of these is the surface film which, even though tossed about by the movement of waves, provides a rich environment and is home to bacteria, fungi, microalgae, protozoa, fish eggs and various larvae. The pelagic zone contains macro- and microfauna and myriad zooplankton which drift with the currents. Most of the smallest organisms are the larvae of fish and marine invertebrates which liberate eggs in vast numbers because the chance of any one embryo surviving to maturity is so minute. The zooplankton feed on phytoplankton and on each other and form a basic part of the complex food chain that extends through variously sized fish and other nektonic organisms to large squid, sharks, porpoises, dolphins and whales. Some marine creatures make large migrations, either to other regions of the ocean on a seasonal basis or vertical migrations daily, often ascending to feed at night and descending to safety by day. Ships can introduce or spread invasive species through the discharge of ballast water or the transport of organisms that have accumulated as part of the fouling community on the hulls of vessels. The demersal zone supports many animals that feed on benthic organisms or seek protection from predators and the seabed provides a range of habitats on or under the surface of the substrate which are used by creatures adapted to these conditions. The tidal zone with its periodic exposure to the dehydrating air is home to barnacles, molluscs and crustaceans. The neritic zone has many organisms that need light to flourish. Here, among algal encrusted rocks live sponges, echinoderms, polychaete worms, sea anemones and other invertebrates. Corals often contain photosynthetic symbionts and live in shallow waters where light penetrates. The extensive calcareous skeletons they extrude build up into coral reefs which are an important feature of the seabed. These provide a biodiverse habitat for reef dwelling organisms. There is less sea life on the floor of deeper seas but marine life also flourishes around seamounts that rise from the depths, where fish and other animals congregate to spawn and feed. Close to the seabed live demersal fish that feed largely on pelagic organisms or benthic invertebrates. Exploration of the deep sea by submersibles revealed a new world of creatures living on the seabed that scientists had not previously known to exist. Some like the detrivores rely on organic material falling to the ocean floor. 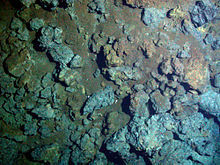 Others cluster round deep sea hydrothermal vents where mineral-rich flows of water emerge from the seabed, supporting communities whose primary producers are sulphide-oxidising chemoautotrophic bacteria, and whose consumers include specialised bivalves, sea anemones, barnacles, crabs, worms and fish, often found nowhere else. (p212) A dead whale sinking to the bottom of the ocean provides food for an assembly of organisms which similarly rely largely on the actions of sulphur-reducing bacteria. Such places support unique biomes where many new microbes and other lifeforms have been discovered. Humans have travelled the seas since they first built sea-going craft. Mesopotamians were using bitumen to caulk their reed boats and, a little later, masted sails. By c. 3000 BC, Austronesians on Taiwan had begun spreading into maritime Southeast Asia. Subsequently, the Austronesian "Lapita" peoples displayed great feats of navigation, reaching out from the Bismarck Archipelago to as far away as Fiji, Tonga, and Samoa. Their descendants continued to travel thousands of miles between tiny islands on outrigger canoes, and in the process they found many new islands, including Hawaii, Easter Island (Rapa Nui), and New Zealand. 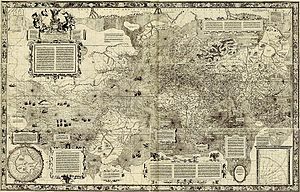 Gerardus Mercator's 1569 world map. The coastline of the old world is quite accurately depicted, unlike that of the Americas. Regions in high latitudes (Arctic, Antarctic) are greatly enlarged on this projection. As for the history of navigational instrument, a compass was first used by the ancient Greeks and Chinese to show where north lies and the direction in which the ship is heading. The latitude (an angle which ranges from 0° at the equator to 90° at the poles) was determined by measuring the angle between the Sun, Moon or a specific star and the horizon by the use of an astrolabe, Jacob's staff or sextant. The longitude (a line on the globe joining the two poles) could only be calculated with an accurate chronometer to show the exact time difference between the ship and a fixed point such as the Greenwich Meridian. In 1759, John Harrison, a clockmaker, designed such an instrument and James Cook used it in his voyages of exploration. Nowadays, the Global Positioning System (GPS) using over thirty satellites enables accurate navigation worldwide. With regards to maps that are vital for navigation, in the second century, Ptolemy mapped the whole known world from the "Fortunatae Insulae", Cape Verde or Canary Islands, eastward to the Gulf of Thailand. This map was used in 1492 when Christopher Columbus set out on his voyages of discovery. Subsequently, Gerardus Mercator made a practical map of the world in 1538, his map projection conveniently making rhumb lines straight. (pp12–13) By the eighteenth century better maps had been made and part of the objective of James Cook on his voyages was to further map the ocean. Scientific study has continued with the depth recordings of the Tuscarora, the oceanic research of the Challenger voyages (1872–1876), the work of the Scandinavian seamen Roald Amundsen and Fridtjof Nansen, the Michael Sars expedition in 1910, the German Meteor expedition of 1925, the Antarctic survey work of Discovery II in 1932, and others since. Furthermore, in 1921, the International Hydrographic Organization was set up, and it constitutes the authority on hydrographic surveying and nautical charting. On her 68,890-nautical-mile (127,580 km) journey round the globe, HMS Challenger discovered about 4,700 new marine species, and made 492 deep sea soundings, 133 bottom dredges, 151 open water trawls and 263 serial water temperature observations. In the southern Atlantic in 1898/1899, Carl Chun on the Valdivia brought many new life forms to the surface from depths of over 4,000 metres (13,000 ft). The first observations of deep-sea animals in their natural environment were made in 1930 by William Beebe and Otis Barton who descended to 434 metres (1,424 ft) in the spherical steel Bathysphere. This was lowered by cable but by 1960 a self-powered submersible, Trieste developed by Jacques Piccard, took Piccard and Don Walsh to the deepest part of the Earth's oceans, the Mariana Trench in the Pacific, reaching a record depth of about 10,915 metres (35,810 ft), a feat not repeated until 2012 when James Cameron piloted the Deepsea Challenger to similar depths. An atmospheric diving suit can be worn for deep sea operations, with a new world record being set in 2006 when a US Navy diver descended to 2,000 feet (610 m) in one of these articulated, pressurized suits. At great depths, no light penetrates through the water layers from above and the pressure is extreme. For deep sea exploration it is necessary to use specialist vehicles, either remotely operated underwater vehicles with lights and cameras or manned submersibles. The battery-operated Mir submersibles have a three-man crew and can descend to 20,000 feet (6,000 m). They have viewing ports, 5,000-watt lights, video equipment and manipulator arms for collecting samples, placing probes or pushing the vehicle across the sea bed when the thrusters would stir up excessive sediment. Bathymetry is the mapping and study of the topography of the ocean floor. Methods used for measuring the depth of the sea include single or multibeam echosounders, laser airborne depth sounders and the calculation of depths from satellite remote sensing data. This information is used for determining the routes of undersea cables and pipelines, for choosing suitable locations for siting oil rigs and offshore wind turbines and for identifying possible new fisheries. Ongoing oceanographic research includes marine lifeforms, conservation, the marine environment, the chemistry of the ocean, the studying and modelling of climate dynamics, the air-sea boundary, weather patterns, ocean resources, renewable energy, waves and currents, and the design and development of new tools and technologies for investigating the deep. Whereas in the 1960s and 1970s research could focus on taxonomy and basic biology, in the 2010s attention has shifted to larger topics such as climate change. Researchers make use of satellite-based remote sensing for surface waters, with research ships, moored observatories and autonomous underwater vehicles to study and monitor all parts of the sea. "Freedom of the seas" is a principle in international law dating from the seventeenth century. It stresses freedom to navigate the oceans and disapproves of war fought in international waters. Today, this concept is enshrined in the United Nations Convention on the Law of the Sea (UNCLOS), the third version of which came into force in 1994. Article 87(1) states: "The high seas are open to all states, whether coastal or land-locked." Article 87(1) (a) to (f) gives a non-exhaustive list of freedoms including navigation, overflight, the laying of submarine cables, building artificial islands, fishing and scientific research. The safety of shipping is regulated by the International Maritime Organization. Its objectives include developing and maintaining a regulatory framework for shipping, maritime safety, environmental concerns, legal matters, technical co-operation and maritime security. UNCLOS defines various areas of water. "Internal waters" are on the landward side of a baseline and foreign vessels have no right of passage in these. "Territorial waters" extend to 12 nautical miles (22 kilometres; 14 miles) from the coastline and in these waters, the coastal state is free to set laws, regulate use and exploit any resource. A "contiguous zone" extending a further 12 nautical miles allows for hot pursuit of vessels suspected of infringing laws in four specific areas: customs, taxation, immigration and pollution. An "exclusive economic zone" extends for 200 nautical miles (370 kilometres; 230 miles) from the baseline. Within this area, the coastal nation has sole exploitation rights over all natural resources. The "continental shelf" is the natural prolongation of the land territory to the continental margin's outer edge, or 200 nautical miles from the coastal state's baseline, whichever is greater. Here the coastal nation has the exclusive right to harvest minerals and also living resources "attached" to the seabed. 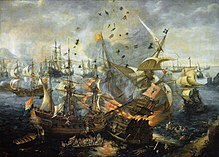 Control of the sea is important to the security of a maritime nation, and the naval blockade of a port can be used to cut off food and supplies in time of war. Battles have been fought on the sea for more than 3,000 years. In about 1210 B.C., Suppiluliuma II, the king of the Hittites, defeated and burned a fleet from Alashiya (modern Cyprus). In the decisive 480 B.C. Battle of Salamis, the Greek general Themistocles trapped the far larger fleet of the Persian king Xerxes in a narrow channel and attacked vigorously, destroying 200 Persian ships for the loss of 40 Greek vessels. At the end of the Age of Sail, the English navy, led by Horatio Nelson, broke the power of the combined French and Spanish fleets at the 1805 Battle of Trafalgar. With steam and the industrial production of steel plate came greatly increased firepower in the shape of the dreadnought battleships armed with long-range guns. In 1905, the Japanese fleet decisively defeated the Russian fleet, which had travelled over 18,000 nautical miles (33,000 km), at the Battle of Tsushima. Dreadnoughts fought inconclusively in the First World War at the 1916 Battle of Jutland between the Royal Navy's Grand Fleet and the Imperial German Navy's High Seas Fleet. In the Second World War, the British victory at the 1940 Battle of Taranto showed that naval air power was sufficient to overcome the largest warships, foreshadowing the decisive sea-battles of the Pacific War including the Battles of the Coral Sea, Midway, the Philippine Sea, and the climactic Battle of Leyte Gulf, in all of which the dominant ships were aircraft carriers. Submarines became important in naval warfare in World War I, when German submarines, known as U-boats, sank nearly 5,000 Allied merchant ships, including however the RMS Lusitania, so helping to bring the United States into the war. In World War II, almost 3,000 Allied ships were sunk by U-boats attempting to block the flow of supplies to Britain, but the Allies broke the blockade in the Battle of the Atlantic, which lasted the whole length of the war, sinking 783 U-boats. Since 1960, several nations have maintained fleets of nuclear-powered ballistic missile submarines, vessels equipped to launch ballistic missiles with nuclear warheads from under the sea. Some of these are kept permanently on patrol. 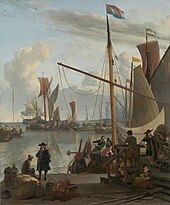 Sailing ships or packets carried mail overseas, one of the earliest being the Dutch service to Batavia in the 1670s. These added passenger accommodation, but in cramped conditions. Later, scheduled services were offered but the time journeys took depended much on the weather. When steamships replaced sailing vessels, ocean-going liners took over the task of carrying people. By the beginning of the twentieth century, crossing the Atlantic took about five days and shipping companies competed to own the largest and fastest vessels. The Blue Riband was an unofficial accolade given to the fastest liner crossing the Atlantic in regular service. The Mauretania held the title with 26.06 knots (48.26 km/h) for twenty years from 1909. The Hales Trophy, another award for the fastest commercial crossing of the Atlantic, was won by the United States in 1952 for a crossing that took three days, ten hours and forty minutes. The great liners were comfortable but expensive in fuel and staff. The age of the trans-Atlantic liners waned as cheap intercontinental flights became available. In 1958, a regular scheduled air service between New York and Paris taking seven hours doomed the Atlantic ferry service to oblivion. One by one the vessels were laid up, some were scrapped, others became cruise ships for the leisure industry and still others floating hotels. The sea is still a route by which boat people travel in small, sometimes unseaworthy craft, often having paid money to people smugglers for their passage. Some may be fleeing persecution but most are economic migrants attempting to reach countries where they believe their prospects are brighter. Maritime trade has existed for millennia. The Ptolemaic dynasty had developed trade with India using the Red Sea ports and in the first millennium BC the Arabs, Phoenicians, Israelites and Indians traded in luxury goods such as spices, gold, and precious stones. The Phoenicians were noted sea traders and under the Greeks and Romans, commerce continued to thrive. With the collapse of the Roman Empire, European trade dwindled but it continued to flourish among the kingdoms of Africa, the Middle East, India, China and southeastern Asia. From the 16th to the 19th centuries, about 13 million people were shipped across the Atlantic to be sold as slaves in the Americas. Nowadays, large quantities of goods are transported by sea, especially across the Atlantic and around the Pacific Rim. A major trade route passes through the Pillars of Hercules, across the Mediterranean and the Suez Canal to the Indian Ocean and through the Straits of Malacca; much trade also passes through the English Channel. Shipping lanes are the routes on the open sea used by cargo vessels, traditionally making use of trade winds and currents. Over 60 percent of the world's container traffic is conveyed on the top twenty trade routes. Increased melting of Arctic ice since 2007 enables ships to travel the Northwest Passage for some weeks in summertime, avoiding the longer routes via the Suez Canal or the Panama Canal. Shipping is supplemented by air freight, a more expensive process mostly used for particularly valuable or perishable cargoes. Seaborne trade carries more than US$4 trillion worth of goods each year. There are two main kinds of freight, bulk cargo and break bulk or general cargo, most of which is now transported in containers. Commodities in the form of liquids, powder or particles are carried loose in the holds of bulk carriers and include oil, grain, coal, ore, scrap metal, sand and gravel. Break bulk cargo is usually manufactured goods and is transported in packages, often stacked on pallets. Before the arrival of containerization in the 1950s, these goods were loaded, transported and unloaded piecemeal. The use of containers has greatly increased the efficiency and decreased the cost of moving them with most freight now traveling in standard sized, lockable containers loaded on purpose-built container ships at dedicated terminals. Freight forwarding firms book cargo, arrange pickup and delivery, and manage documentation. Fish and other fishery products are among the most important sources of protein and other nutrients that are essential for a balanced diet and good health. In 2009, 16.6% of the world's intake of animal protein and 6.5% of all protein consumed came from fish. In order to fulfill this need, coastal countries have exploited marine resources in their exclusive economic zone, although fishing vessels are increasingly venturing further afield to exploit stocks in international waters. In 2011, the total world production of fish, including aquaculture, was estimated to be 154 million tonnes, of which most was for human consumption. The harvesting of wild fish accounted for 90.4 million tonnes, while annually increasing aquaculture contributes the rest. The north west Pacific is by far the most productive area with 20.9 million tonnes (27 percent of the global marine catch) in 2010. In addition, the number of fishing vessels in 2010 reached 4.36 million, whereas the number of people employed in the primary sector of fish production in the same year amounted to 54.8 million. Modern fishing vessels include fishing trawlers with a small crew, stern trawlers, purse seiners, long-line factory vessels and large factory ships which are designed to stay at sea for weeks, processing and freezing great quantities of fish. The equipment used to capture the fish may be purse seines, other seines, trawls, dredges, gillnets and long-lines and the fish species most frequently targeted are herring, cod, anchovy, tuna, flounder, mullet, squid and salmon. Overexploitation itself has become a serious concern; it does not only cause the depletion of fish stocks, but also substantially reduce the population of predatory fish populations. Myers & Wworm estimated that "industrialized fisheries typically reduced community biomass by 80% within 15 years of exploitation." In order to avoid overexploitation, many countries have introduced quotas in their own waters. However, recovery efforts often entail substantial costs to local economies or food provision. Nonetheless, research published in Nature in April 2018 found that the aggressive effort of the Indonesian Minister of Maritime Affairs and Fisheries of Indonesia Susi Pudjiastuti to curtail illegal fishing has "reduced total fishing effort by at least 25%, (...) [potentially] generate a 14% increase in catch and a 12% increase in profit." Therefore, the paper concluded that "many nations can recover their fisheries while avoiding these short-term costs by sharply addressing illegal, unreported and unregulated (IUU) fishing." Artisan fishing methods include rod and line, harpoons, skin diving, traps, throw nets and drag nets. Traditional fishing boats are powered by paddle, wind or outboard motors and operate in near-shore waters. The Food and Agriculture Organization is encouraging the development of local fisheries to provide food security to coastal communities and help alleviate poverty. As well as the wild stock, about 79 million tonnes (78M long tons; 87M short tons) of food and non-food products were produced by aquaculture in 2010, an all-time high. About six hundred species of plants and animals were cultured, some for use in seeding wild populations. The animals raised included finfish, aquatic reptiles, crustaceans, molluscs, sea cucumbers, sea urchins, sea squirts and jellyfish. Integrated mariculture has the advantage that there is a readily available supply of planktonic food and waste is removed naturally. Various methods are employed. Mesh enclosures for finfish can be suspended in the open seas, cages can be used in more sheltered waters or ponds can be refreshed with water at each high tide. Shrimps can be reared in shallow ponds connected to the open sea. Ropes can be hung in water to grow algae, oysters and mussels. Oysters can be reared on trays or in mesh tubes. Sea cucumbers can be ranched on the seabed. Captive breeding programmes have raised lobster larvae for release of juveniles into the wild resulting in an increased lobster harvest in Maine. At least 145 species of seaweed – red, green, and brown algae – are eaten worldwide, and some have long been farmed in Japan and other Asian countries; there is great potential for additional algaculture. Few maritime flowering plants are widely used for food but one example is marsh samphire which is eaten both raw and cooked. A major difficulty for aquaculture is the tendency towards monoculture and the associated risk of widespread disease. In the 1990s, disease wiped out China's farmed Farrer's scallop and white shrimp and required their replacement by other species. Aquaculture is also associated with environmental risks; for instance, shrimp farming has caused the destruction of important mangrove forests throughout southeast Asia. Use of the sea for leisure developed in the nineteenth century, and became a significant industry in the twentieth century. Maritime leisure activities are varied, and include self-organized trips cruising, yachting, powerboat racing and fishing; commercially organized voyages on cruise ships; and trips on smaller vessels for ecotourism such as whale watching and coastal birdwatching. Humans enjoy venturing into the sea; children paddle and splash in the shallows and many people take pleasure in bathing and relaxing on the beach. This was not always the case, with sea bathing becoming the vogue in Europe in the 18th century after Dr. William Buchan advocated the practice for health reasons. Surfing is a sport in which a wave is ridden by a surfer, with or without a surfboard. Other marine water sports include kite surfing, where a power kite propels a manned board across the water, windsurfing, where the power is provided by a fixed, manoeuvrable sail and water skiing, where a powerboat is used to pull a skier. Beneath the surface, freediving is necessarily restricted to shallow descents. Pearl divers have traditionally greased their skins, put cotton in their ears and clips on their noses and dived to 40 feet (12 m) with baskets to collect oysters. Human eyes are not adapted for use underwater but vision can be improved by wearing a diving mask. 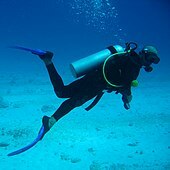 Other useful equipment includes fins and snorkels, and scuba equipment allows underwater breathing and hence a longer time can be spent beneath the surface. The depths that can be reached by divers and the length of time they can stay underwater is limited by the increase of pressure they experience as they descend and the need to prevent decompression sickness as they return to the surface. Recreational divers are advised to restrict themselves to depths of 100 feet (30 m) beyond which the danger of nitrogen narcosis increases. Deeper dives can be made with specialised equipment and training. The sea offers a very large supply of energy carried by ocean waves, tides, salinity differences, and ocean temperature differences which can be harnessed to generate electricity. Forms of 'green' marine energy include tidal power, marine current power, osmotic power, ocean thermal energy and wave power. Tidal power: the 1 km Rance Tidal Power Station, Brittany, generates 0.5 GW. The large and highly variable energy of waves gives them enormous destructive capability, making affordable and reliable wave machines problematic to develop. A small 2 MW commercial wave power plant, "Osprey", was built in Northern Scotland in 1995 about 300 metres (1000 ft) offshore. It was soon damaged by waves, then destroyed by a storm. (p112) Marine current power could provide populated areas close to the sea with a significant part of their energy needs. In principle, it could be harnessed by open-flow turbines; sea bed systems are available, but limited to a depth of about 40 metres (130 ft). Offshore wind power is captured by wind turbines placed out at sea; it has the advantage that wind speeds are higher than on land, though wind farms are more costly to construct offshore. The first offshore wind farm was installed in Denmark in 1991, and the installed capacity of European offshore wind farms reached 3 GW in 2010. Electricity power stations are often located on the coast or beside an estuary so that the sea can be used as a heat sink. A colder heat sink enables more efficient power generation, which is important for expensive nuclear power plants in particular. The seabed contains enormous reserves of minerals which can be exploited by dredging. This has advantages over land-based mining in that equipment can be built at specialised shipyards and infrastructure costs are lower. Disadvantages include problems caused by waves and tides, the tendency for excavations to silt up and the washing away of spoil heaps. There is a risk of coastal erosion and environmental damage. Seafloor massive sulphide deposits are potential sources of silver, gold, copper, lead and zinc and trace metals since their discovery in the 1960s. They form when geothermally heated water is emitted from deep sea hydrothermal vents known as "black smokers". The ores are of high quality but prohibitively costly to extract. Small scale mining of the deep sea floor is being developed off the coast of Papua New Guinea using robotic techniques, but the obstacles are formidable. There are large deposits of petroleum, as oil and natural gas, in rocks beneath the seabed. Offshore platforms and drilling rigs extract the oil or gas and store it for transport to land. Offshore oil and gas production can be difficult due to the remote, harsh environment. Drilling for oil in the sea has environmental impacts. Animals may be disorientated by seismic waves used to locate deposits, probably causing the beaching of whales. Toxic substances such as mercury, lead and arsenic may be released. The infrastructure may cause damage, and oil may be spilt. Large quantities of methane clathrate exist on the seabed and in ocean sediment at a temperature of around 2 °C (36 °F) and these are of interest as a potential energy source. Some estimates put the amount available at between one and 5 million cubic kilometres (0.24 to 1.2 million cubic miles). Also on the seabed are manganese nodules formed of layers of iron, manganese and other hydroxides around a core. In the Pacific these may cover up to 30 percent of the deep ocean floor. The minerals precipitate from seawater and grow very slowly. Their commercial extraction for nickel was investigated in the 1970s but abandoned in favour of more convenient sources. In suitable locations, diamonds are gathered from the seafloor using suction hoses to bring gravel ashore. In deeper waters, mobile seafloor crawlers are used and the deposits are pumped to a vessel above. In Namibia, more diamonds are now collected from marine sources than by conventional methods on land. The sea holds enormous quantities of valuable dissolved minerals. The most important, Salt for table and industrial use has been harvested by solar evaporation from shallow ponds since prehistoric times. Bromine, accumulated after being leached from the land, is economically recovered from the Dead Sea, where it occurs at 55,000 parts per million (ppm). Desalination is the technique of removing salts from seawater to leave fresh water suitable for drinking or irrigation. The two main processing methods, vacuum distillation and reverse osmosis, use large quantities of energy. Desalination is normally only undertaken where fresh water from other sources is in short supply or energy is plentiful, as in the excess heat generated by power stations. The brine produced as a by-product contains some toxic materials and is returned to the sea. Many substances enter the sea as a result of human activities. Combustion products are transported in the air and deposited into the sea by precipitation. Industrial outflows and sewage contribute heavy metals, pesticides, PCBs, disinfectants, household cleaning products and other synthetic chemicals. These become concentrated in the surface film and in marine sediment, especially estuarine mud. The result of all this contamination is largely unknown because of the large number of substances involved and the lack of information on their biological effects. The heavy metals of greatest concern are copper, lead, mercury, cadmium and zinc which may be bio-accumulated by marine invertebrates. They are cumulative toxins and are passed up the food chain. Much floating plastic rubbish does not biodegrade, instead disintegrating over time and eventually breaking down to the molecular level. Rigid plastics may float for years. In the centre of the Pacific gyre there is a permanent floating accumulation of mostly plastic waste and there is a similar garbage patch in the Atlantic. Foraging sea birds such as the albatross and petrel may mistake debris for food, and accumulate indigestible plastic in their digestive systems. Turtles and whales have been found with plastic bags and fishing line in their stomachs. Microplastics may sink, threatening filter feeders on the seabed. Most oil pollution in the sea comes from cities and industry. Oil is dangerous for marine animals. It can clog the feathers of sea birds, reducing their insulating effect and the birds' buoyancy, and be ingested when they preen themselves in an attempt to remove the contaminant. Marine mammals are less seriously affected but may be chilled through the removal of their insulation, blinded, dehydrated or poisoned. Benthic invertebrates are swamped when the oil sinks, fish are poisoned and the food chain is disrupted. In the short term, oil spills result in wildlife populations being decreased and unbalanced, leisure activities being affected and the livelihoods of people dependant on the sea being devastated. The marine environment has self-cleansing properties and naturally occurring bacteria will act over time to remove oil from the sea. In the Gulf of Mexico, where oil-eating bacteria are already present, they take only a few days to consume spilt oil. Run-off of fertilisers from agricultural land is a major source of pollution in some areas and the discharge of raw sewage has a similar effect. The extra nutrients provided by these sources can cause excessive plant growth. Nitrogen is often the limiting factor in marine systems, and with added nitrogen, algal blooms and red tides can lower the oxygen level of the water and kill marine animals. Such events have created dead zones in the Baltic Sea and the Gulf of Mexico. Some algal blooms are caused by cyanobacteria that make shellfish that filter feed on them toxic, harming animals like sea otters. Nuclear facilities too can pollute. The Irish Sea was contaminated by radioactive caesium-137 from the former Sellafield nuclear fuel processing plant and nuclear accidents may also cause radioactive material to seep into the sea, as did the disaster at the Fukushima Daiichi Nuclear Power Plant in 2011. The dumping of waste (including oil, noxious liquids, sewage and garbage) at sea is governed by international law. The London Convention (1972) is a United Nations agreement to control ocean dumping which had been ratified by 89 countries by 8 June 2012. MARPOL 73/78 is a convention to minimize pollution of the seas by ships. By May 2013, 152 maritime nations had ratified MARPOL. Several nomadic indigenous groups in Maritime Southeast Asia live in boats and derive nearly all they need from the sea. The Moken people live on the coasts of Thailand and Burma and islands in the Andaman Sea. The Bajau people are originally from the Sulu Archipelago, Mindanao and northern Borneo. 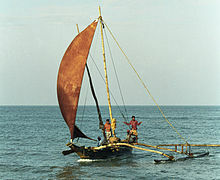 Some Sea Gypsies are accomplished free-divers, able to descend to depths of 30 metres (98 ft), though many are adopting a more settled, land-based way of life. The indigenous peoples of the Arctic such as the Chukchi, Inuit, Inuvialuit and Yup'iit hunt marine mammals including seals and whales, and the Torres Strait Islanders of Australia include ownership of the Great Barrier Reef among their possessions. They live a traditional life on the islands involving hunting, fishing, gardening and trading with neighbouring peoples in Papua and mainland Aboriginal Australians. Music too has been inspired by the ocean, sometimes by composers who lived or worked near the shore and saw its many different aspects. Sea shanties, songs that were chanted by mariners to help them perform arduous tasks, have been woven into compositions and impressions in music have been created of calm waters, crashing waves and storms at sea. Classical sea-related music includes Richard Wagner's The Flying Dutchman, Claude Debussy's La mer (1903–05), Charles Villiers Stanford's Songs of the Sea (1904) and Songs of the Fleet (1910), Edward Elgar's Sea Pictures (1899) and Ralph Vaughan Williams' A Sea Symphony (1903–1909). As a symbol, the sea has for centuries played a role in literature, poetry and dreams. Sometimes it is there just as a gentle background but often it introduces such themes as storm, shipwreck, battle, hardship, disaster, the dashing of hopes and death. In his epic poem the Odyssey, written in the 8th century BC, Homer describes the ten-year voyage of the Greek hero Odysseus who struggles to return home across the sea's many hazards after the war described in the Iliad. The sea is a recurring theme in the Haiku poems of the Japanese Edo period poet Matsuo Bashō (松尾 芭蕉) (1644–1694). In modern literature, sea-inspired novels have been written by Joseph Conrad — drawn from his experience at sea, Herman Wouk, and Herman Melville. In the works of psychiatrist Carl Jung, the sea symbolizes the personal and the collective unconscious in dream interpretation, the depths of the sea symbolizing the depths of the unconscious mind. Although the origin of life on Earth is still a matter of debate, scientist and writer Rachel Carson, in her award-winning 1951 book The Sea Around Us, wrote, "It is a curious situation that the sea, from which life first arose, should now be threatened by the activities of one form of that life. But the sea, though changed in a sinister way, will continue to exist: the threat is rather to life itself". ^ There is no accepted technical definition of sea amongst oceanographers. 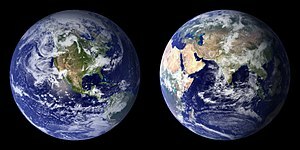 One definition is that a sea is a sub-division of an ocean, which means that it must have oceanic basin crust on its floor. This definition accepts the Caspian as a sea because it was once part of an ancient ocean. The Introduction to Marine Biology defines a sea as a "land-locked" body of water, adding that the term "sea" is only one of convenience. The Glossary of Mapping Sciences similarly states that the boundaries between seas and other bodies of water are arbitrary. ^ According to this definition, the Caspian would be excluded as it is legally an "international lake". ^ Hydrous ringwoodite recovered from volcanic eruptions suggests that the transition zone between the lower and upper mantle holds between one and three times as much water as all of the world's surface oceans combined. Experiments to recreate the conditions of the lower mantle suggest it may contain still more water as well, as much as five times the mass of water present in the world's oceans. ^ To help put a change of this magnitude into perspective, when the pH of human blood plasma is raised from its normal 7.4 to a value above 7.8, or lowered to a value below 6.8, death ensues. ^ "Sea". Merriam-webster.com. Retrieved 13 March 2013. ^ "What's the difference between an ocean and a sea?". Ocean facts. National Oceanic and Atmospheric Administration. Retrieved 19 April 2013. ^ a b c d e f g h i j k l m n o p q r s t u v w x y z aa ab Stow, Dorrik (2004). Encyclopedia of the Oceans. Oxford University Press. ISBN 978-0-19-860687-1. ^ Nishri, A.; Stiller, M; Rimmer, A.; Geifman, Y.; Krom, M. (1999). "Lake Kinneret (The Sea of Galilee): the effects of diversion of external salinity sources and the probable chemical composition of the internal salinity sources". Chemical Geology. 158 (1–2): 37–52. doi:10.1016/S0009-2541(99)00007-8. ^ Conforti, B.; Bravo, Luigi Ferrari (2005). The Italian Yearbook of International Law, Volume 14. Martinus Nijhoff Publishers. p. 237. ISBN 978-90-04-15027-0. ^ Karleskint, George; Turner, Richard L.; Small, James W. (2009). Introduction to Marine Biology. Cengage Learning. p. 47. ISBN 978-0-495-56197-2. ^ Vukas, B. (2004). The Law of the Sea: Selected Writings. Martinus Nijhoff Publishers. p. 271. ISBN 978-90-04-13863-6. ^ Gupta, Manoj (2010). Indian Ocean Region: Maritime Regimes for Regional Cooperation. Springer. p. 57. ISBN 978-1-4419-5989-8. ^ Gokay, Bulent (2001). The Politics of Caspian Oil. Palgrave Macmillan. p. 74. ISBN 978-0-333-73973-0. ^ a b NOAA. "Lesson 7: The Water Cycle" in Ocean Explorer. ^ Schmandt, B.; Jacobsen, S. D.; Becker, T. W.; Liu, Z.; Dueker, K. G. (2014). "Dehydration melting at the top of the lower mantle". Science. 344 (6189): 1265–68. Bibcode:2014Sci...344.1265S. doi:10.1126/science.1253358. ^ Murakami, M. (2002). "Water in Earth's Lower Mantle". Science. 295 (5561): 1885–87. Bibcode:2002Sci...295.1885M. doi:10.1126/science.1065998. ^ a b c Monkhouse, F.J. (1975) Principles of Physical Geography. pp. 327–28. Hodder & Stoughton. ISBN 978-0-340-04944-0. ^ b., R. N. R.; Russell, F. S.; Yonge, C. M. (1929). "The Seas: Our Knowledge of Life in the Sea and How It is Gained". The Geographical Journal. 73 (6): 571–572. doi:10.2307/1785367. JSTOR 1785367. ^ Cowen, Ron (5 October 2011). "Comets take pole position as water bearers". Nature. Retrieved 10 September 2013. ^ "Ocean salinity". Science Learning Hub. Retrieved 2 July 2017. ^ A. Anati, David (March 1999). "The salinity of hypersaline brines: Concepts and misconceptions". International Journal of Salt Lake Research. 8: 55–70. doi:10.1023/A:1009059827435. ^ Swenson, Herbert. "Why is the ocean salty?". US Geological Survey. Archived from the original on 18 April 2001. Retrieved 17 April 2013. ^ a b Millero, F. J.; Feistel, R.; Wright, D. G.; McDougall, T. J. (2008). "The composition of Standard Seawater and the definition of the Reference-Composition Salinity Scale". Deep-Sea Research Part I: Oceanographic Research Papers. 55 (1): 50–72. Bibcode:2008DSRI...55...50M. doi:10.1016/j.dsr.2007.10.001. ^ "Drinking seawater can be deadly to humans". NOAA. 11 January 2013. Retrieved 16 September 2013. ^ a b Talley, Lynne D (2002). "Salinity Patterns in the Ocean". In MacCracken, Michael C; Perry, John S (eds.). Encyclopedia of Global Environmental Change, Volume 1, The Earth System: Physical and Chemical Dimensions of Global Environmental Change. John Wiley & Sons. pp. 629–630. ISBN 978-0-471-97796-4. ^ Feistel, R; et al. (2010). "Density and Absolute Salinity of the Baltic Sea 2006–2009". Ocean Science. 6: 3–24. doi:10.5194/os-6-3-2010. ^ Gordon, Arnold (2004). "Ocean Circulation". The Climate System. Columbia University. Retrieved 6 July 2013. ^ "Sea Water, Freezing of". Water Encyclopedia. Retrieved 12 October 2013. ^ Jeffries, Martin O. (2012). "Sea ice". Encyclopedia Britannica. Britannica Online Encyclopedia. Retrieved 21 April 2013. ^ "Oxygen in the Sea". Swedish Meteorological and Hydrological Institute. 3 June 2010. Retrieved 6 July 2013. ^ a b Russell, F. S.; Yonge, C. M. (1928). The Seas. Frederick Warne. pp. 225–227. ^ a b c "Ocean waves". Ocean Explorer. National Oceanic and Atmospheric Administration. Retrieved 17 April 2013. ^ Young, I. R. (1999). Wind Generated Ocean Waves. Elsevier. p. 83. ISBN 978-0-08-043317-2. ^ a b c Garrison, Tom (2012). Essentials of Oceanography. 6th ed. pp. 204 ff. Brooks/Cole, Belmont. ISBN 0321814053. ^ Goda, Y. (2000) Random Seas and Design of Maritime Structures. pp. 421–22. World Scientific. ISBN 978-981-02-3256-6. ^ Holliday, N. P.; Yelland, M. J.; Pascal, R.; Swail, V. R.; Taylor, P. K.; Griffiths, C. R.; Kent, E. (2006). "Were extreme waves in the Rockall Trough the largest ever recorded?". Geophysical Research Letters. 33 (5): L05613. Bibcode:2006GeoRL..33.5613H. doi:10.1029/2005GL025238. ^ Laird, Anne (2006). "Observed Statistics of Extreme Waves". Naval Postgraduate School (Monterey). ^ a b c "Life of a Tsunami". Tsunamis & Earthquakes. US Geological Survey. Retrieved 18 April 2013. ^ a b "Physics of Tsunamis". National Tsunami Warning Center of the USA. Retrieved 3 October 2013. ^ a b c "The Physics of Tsunamis". Earth and Space Sciences. University of Washington. Retrieved 21 September 2013. ^ Our Amazing Planet staff (12 March 2012). "Deep Ocean Floor Can Focus Tsunami Waves". Livescience. Retrieved 4 October 2013. ^ Berry, M. V. (2007). 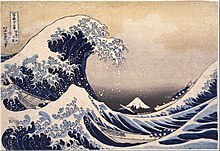 "Focused tsunami waves". Proceedings of the Royal Society A. 463 (2087): 3055–3071. doi:10.1098/rspa.2007.0051. ^ "Tsunami Facts and Information". Bureau of Meteorology of the Australian Government. Retrieved 3 October 2013. ^ Ahrens, C. Donald; Jackson, Peter Lawrence; Jackson, Christine E. J.; Jackson, Christine E. O. (2012). Meteorology Today: An Introduction to Weather, Climate, and the Environment. Cengage Learning. p. 283. ISBN 978-0-17-650039-9. ^ a b c d "Ocean Currents". Ocean Explorer. National Oceanic and Atmospheric Administration. Retrieved 19 April 2013. ^ Pope, Vicky (2 February 2007). "Models 'key to climate forecasts'". BBC. Retrieved 8 September 2013. ^ Wunsch, Carl (2002). 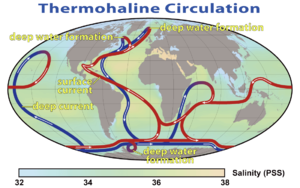 "What is the thermohaline circulation?". Science. 298 (5596): 1179–1181. doi:10.1126/science.1079329. PMID 12424356. ^ "Long-shore currents". Orange County Lifeguards. 2007. Retrieved 19 April 2013. ^ "Rip current characteristics". Rip currents. University of Delaware Sea Grant College Program. Retrieved 19 April 2013. ^ a b c "Tides and Water Levels". NOAA Oceans and Coasts. NOAA Ocean Service Education. Retrieved 20 April 2013. ^ "Tidal amplitudes". University of Guelph. Retrieved 12 September 2013. ^ a b "Tides". Ocean Explorer. National Oceanic and Atmospheric Administration. Retrieved 20 April 2013. ^ Eginitis, D. (1929). "The problem of the tide of Euripus". Astronomische Nachrichten. 236 (19–20): 321–328. Bibcode:1929AN....236..321E. doi:10.1002/asna.19292361904. See also the commentary about this explanation in Lagrange, E. (1930). "Les marées de l'Euripe". Ciel et Terre (Bulletin of the Société Belge d'Astronomie) (in French). 46: 66–69. Bibcode:1930C&T....46...66L. ^ Cline, Isaac M. (4 February 2004). "Galveston Storm of 1900". National Oceanic and Atmospheric Administration. Retrieved 21 April 2013. ^ Pidwirny, Michael (28 March 2013). "Structure of the Earth". The Encyclopedia of Earth. Retrieved 20 September 2013. ^ Pidwirny, Michael (28 March 2013). "Plate tectonics". The Encyclopedia of Earth. Retrieved 20 September 2013. ^ "Plate Tectonics: The Mechanism". University of California Museum of Paleontology. Retrieved 20 September 2013. ^ "Scientists map Mariana Trench, deepest known section of ocean in the world". The Telegraph. 7 December 2011. Retrieved 24 September 2013. ^ "Peru-Chile Trench". Encyclopedia Britannica. Britannica Online Encyclopedia. Retrieved 24 September 2013. ^ a b c Monkhouse, F. J. (1975). Principles of Physical Geography. Hodder & Stoughton. pp. 280–291. ISBN 978-0-340-04944-0. ^ Whittow, John B. (1984). The Penguin Dictionary of Physical Geography. Penguin Books. pp. 29, 80, 246. ISBN 978-0-14-051094-2. ^ "Thames Barrier engineer says second defence needed". BBC News. 5 January 2013. Retrieved 18 September 2013. ^ Plant, G.W. ; Covil, C.S; Hughes, R.A. (1998). Site Preparation for the New Hong Kong International Airport. Thomas Telford. pp. 1–4, 43. ISBN 978-0-7277-2696-4. ^ Muller, R. D.; Sdrolias, M.; Gaina, C.; Steinberger, B.; Heine, C. (2008). "Long-Term Sea-Level Fluctuations Driven by Ocean Basin Dynamics". Science. 319 (5868): 1357–62. Bibcode:2008Sci...319.1357M. doi:10.1126/science.1151540. PMID 18323446. ^ Bindoff, N. L.; Willebrand, J.; Artale, V.; Cazenave, A.; Gregory, J.; Gulev, S.; Hanawa, K.; Le Quéré, C.; Levitus, S.; Nojiri, Y.; Shum, A.; Talley, L. D.; Unnikrishnan, A. S.; Josey, S. A.; Tamisiea, M.; Tsimplis, M.; Woodworth, P. (2007). Observations: Oceanic Climate Change and Sea Level. Cambridge University Press. pp. 385–428. ISBN 978-0-521-88009-1. ^ Meehl, G. A.; Washington, W. M.; Collins, W. D.; Arblaster, J. M.; Hu, A.; Buja, L. E.; Strand, W. G.; Teng, H. (2005). "How Much More Global Warming and Sea Level Rise?" (Full free text). Science. 307 (5716): 1769–72. Bibcode:2005Sci...307.1769M. doi:10.1126/science.1106663. PMID 15774757. ^ "The Water Cycle: The Oceans". US Geological Survey. Retrieved 12 September 2013. ^ Vesilind, Priit J. (2003). "The Driest Place on Earth". National Geographic. Archived from the original on 6 July 2011. Retrieved 12 September 2013. ^ "Endorheic Lakes: Waterbodies That Don't Flow to the Sea". The Watershed: Water from the Mountains into the Sea. United Nations Environment Programme. Retrieved 16 September 2013. ^ a b Falkowski, P.; Scholes, R. J.; Boyle, E.; Canadell, J.; Canfield, D.; Elser, J.; Gruber, N.; Hibbard, K.; Högberg, P.; Linder, S.; MacKenzie, F. T.; Moore b, 3.; Pedersen, T.; Rosenthal, Y.; Seitzinger, S.; Smetacek, V.; Steffen, W. (2000). "The Global Carbon Cycle: A Test of Our Knowledge of Earth as a System". Science. 290 (5490): 291–96. Bibcode:2000Sci...290..291F. doi:10.1126/science.290.5490.291. PMID 11030643. ^ Sarmiento, J. L.; Gruber, N. (2006). Ocean Biogeochemical Dynamics. Princeton University Press. ^ a b Prentice, I. C. (2001). "The carbon cycle and atmospheric carbon dioxide". Climate change 2001: the scientific basis: contribution of Working Group I to the Third Assessment Report of the Intergouvernmental Panel on Climate Change / Houghton, J. T. [ed.] Retrieved 26 September 2012. ^ McSween, Harry Y.; McAfee, Steven (2003). Geochemistry: Pathways and Processes. Columbia University Press. p. 143. ^ a b "Ocean Acidification". National Geographic. 27 April 2017. Retrieved 9 October 2018. ^ Feely, R. A.; Sabine, C. L.; Lee, K; Berelson, W; Kleypas, J; Fabry, V. J.; Millero, F. J. (2004). "Impact of Anthropogenic CO2 on the CaCO3 System in the Oceans". Science. 305 (5682): 362–66. Bibcode:2004Sci...305..362F. doi:10.1126/science.1097329. PMID 15256664. ^ Zeebe, R. E.; Zachos, J. C.; Caldeira, K.; Tyrrell, T. (2008). "OCEANS: Carbon Emissions and Acidification". Science. 321 (5885): 51–52. doi:10.1126/science.1159124. PMID 18599765. ^ Gattuso, J.-P.; Hansson, L. (2011). Ocean Acidification. Oxford University Press. ISBN 978-0-19-959109-1. OCLC 730413873. ^ a b "Ocean acidification". Department of Sustainability, Environment, Water, Population & Communities: Australian Antarctic Division. 28 September 2007. ^ Tanner, G. A. (2012). "Acid-Base Homeostasis". In Rhoades, R. A.; Bell, D. R. (eds.). Medical Physiology: Principles for Clinical Medicine. Lippincott Williams & Wilkins. ISBN 978-1-60913-427-3. ^ Pinet, Paul R. (1996). Invitation to Oceanography. West Publishing Company. pp. 126, 134–35. ISBN 978-0-314-06339-7. ^ "What is Ocean Acidification?". NOAA PMEL Carbon Program. ^ Orr, J. C.; Fabry, V. J.; Aumont, O.; Bopp, L.; Doney, S. C.; Feely, R. A.; Gnanadesikan, A.; Gruber, N.; Ishida, A.; Joos, F.; Key, R. M.; Lindsay, K.; Maier-Reimer, E.; Matear, R.; Monfray, P.; Mouchet, A.; Najjar, R. G.; Plattner, G. K.; Rodgers, K. B.; Sabine, C. L.; Sarmiento, J. L.; Schlitzer, R.; Slater, R. D.; Totterdell, I. J.; Weirig, M. F.; Yamanaka, Y.; Yool, A. (2005). "Anthropogenic ocean acidification over the twenty-first century and its impact on calcifying organisms". Nature. 437 (7059): 681–86. Bibcode:2005Natur.437..681O. doi:10.1038/nature04095. PMID 16193043. ^ Cohen, A.; Holcomb, M. (2009). "Why Corals Care About Ocean Acidification: Uncovering the Mechanism". Oceanography. 22 (4): 118–27. doi:10.5670/oceanog.2009.102. ^ Honisch, B.; Ridgwell, A.; Schmidt, D. N.; Thomas, E.; Gibbs, S. J.; Sluijs, A.; Zeebe, R.; Kump, L.; Martindale, R. C.; Greene, S. E.; Kiessling, W.; Ries, J.; Zachos, J. C.; Royer, D. L.; Barker, S.; Marchitto Jr, T. M.; Moyer, R.; Pelejero, C.; Ziveri, P.; Foster, G. L.; Williams, B. (2012). "The Geological Record of Ocean Acidification". Science. 335 (6072): 1058–63. Bibcode:2012Sci...335.1058H. doi:10.1126/science.1208277. PMID 22383840. ^ Gruber, N. (2011). "Warming up, turning sour, losing breath: Ocean biogeochemistry under global change". Philosophical Transactions of the Royal Society A: Mathematical, Physical and Engineering Sciences. 369 (1943): 1980–96. Bibcode:2011RSPTA.369.1980G. doi:10.1098/rsta.2011.0003. PMID 21502171. ^ "Profile". Department of Natural Environmental Studies: University of Tokyo. Retrieved 26 September 2013. ^ Levinton, Jeffrey S. (2010). "18. Fisheries and Food from the Sea". Marine Biology: International Edition: Function, Biodiversity, Ecology. Oxford University Press. ISBN 978-0-19-976661-1. ^ a b Kindersley, Dorling (2011). Illustrated Encyclopedia of the Ocean. Dorling Kindersley. ISBN 978-1-4053-3308-5. ^ Spalding MD and Grenfell AM (1997). "New estimates of global and regional coral reef areas". Coral Reefs. 16 (4): 225. doi:10.1007/s003380050078. ^ Neulinger, Sven (2008–2009). "Cold-water reefs". CoralScience.org. Retrieved 22 April 2013. ^ Roach, John (7 June 2004). "Source of Half Earth's Oxygen Gets Little Credit". National Geographic News. Retrieved 4 April 2016. ^ Yool, A.; Tyrrell, T. (2003). "Role of diatoms in regulating the ocean's silicon cycle". Global Biogeochemical Cycles. 17 (4): n/a. Bibcode:2003GBioC..17.1103Y. CiteSeerX 10.1.1.394.3912. doi:10.1029/2002GB002018. ^ van der Heide, T.; van Nes, E. H.; van Katwijk, M. M.; Olff, H.; Smolders, A. J. P. (2011). Romanuk, Tamara (ed.). "Positive feedbacks in seagrass ecosystems: evidence from large-scale empirical data". PLoS ONE. 6 (1): e16504. Bibcode:2011PLoSO...616504V. doi:10.1371/journal.pone.0016504. ^ "Mangal (Mangrove)". Mildred E. Mathias Botanical Garden. Retrieved 11 July 2013. ^ "Coastal Salt Marsh". Mildred E. Mathias Botanical Garden. Retrieved 11 July 2013. ^ "Facts and figures on marine biodiversity". Marine biodiversity. UNESCO. 2012. Retrieved 11 July 2013. ^ Voss, Maren; Bange, Hermann W.; Dippner, Joachim W.; Middelburg, Jack J.; Montoya, Joseph P.; Ward, Bess (2013). "The marine nitrogen cycle: recent discoveries, uncertainties and the potential relevance of climate change". Philosophical Transactions of the Royal Society B. 368 (1621): 20130121. doi:10.1098/rstb.2013.0121. ^ a b Thorne-Miller, Boyce (1999). The Living Ocean: Understanding and Protecting Marine Biodiversity. Island Press. p. 2. ISBN 978-1-59726-897-4. ^ Thorne-Miller, Boyce (1999). The Living Ocean: Understanding and Protecting Marine Biodiversity. Island Press. p. 88. ISBN 978-1-59726-897-4. ^ Kingsford, Michael John. "Marine ecosystem: Plankton". Encyclopedia Britannica. Britannica Online Encyclopedia. Retrieved 14 July 2013. ^ Walrond, Carl. "Oceanic Fish". The Encyclopedia of New Zealand. New Zealand Government. Retrieved 14 July 2013. ^ "Invasive species". Water: Habitat Protection. Environmental Protection Agency. 6 March 2012. Retrieved 17 September 2013. ^ Sedberry, G. R.; Musick, J. A. (1978). "Feeding strategies of some demersal fishes of the continental slope and rise off the Mid-Atlantic Coast of the USA". Marine Biology. 44 (44): 357–375. doi:10.1007/BF00390900. ^ Committee on Biological Diversity in Marine Systems, National Research Council (1995). "Waiting for a whale: human hunting and deep-sea biodiversity". Understanding Marine Biodiversity. National Academies Press. ISBN 978-0-309-17641-5. ^ Carter, Robert (2012). A Companion to the Archaeology of the Ancient Near East. Ch. 19: "Watercraft", pp. 347 ff. Wiley-Blackwell. ISBN 978-1-4051-8988-0. ^ Hage, P.; Marck, J. (2003). "Matrilineality and the Melanesian Origin of Polynesian Y Chromosomes". Current Anthropology. 44: S121–S127. doi:10.1086/379272. ^ Clark, Liesl (15 February 2000). "Polynesia's Genius Navigators". NOVA. ^ Kayser, M.; Brauer, S; Cordaux, R; Casto, A; Lao, O; Zhivotovsky, L. A.; Moyse-Faurie, C; Rutledge, R. B.; Schiefenhoevel, W; Gil, D; Lin, A. A.; Underhill, P. A.; Oefner, P. J.; Trent, R. J.; Stoneking, M (2006). "Melanesian and Asian Origins of Polynesians: MtDNA and Y Chromosome Gradients Across the Pacific" (PDF). Molecular Biology and Evolution. 23 (11): 2234–44. doi:10.1093/molbev/msl093. PMID 16923821. ^ "The Ancient World – Egypt". Mariners' Museum. 2012. Archived from the original on 23 July 2010. Retrieved 5 March 2012. ^ Greer, Thomas H.; Lewis, Gavin (2004). A Brief History Of The Western World. Thomson Wadsworth. p. 63. ISBN 978-0-534-64236-5. ^ Harden, Donald (1962). The Phoenicians, p. 168. Penguin (Harmondsworth). ^ Warmington, Brian H. (1960) Carthage, p. 79. Penguin (Harmondsworth). ^ Pálsson, Hermann (1965). The Vinland sagas: the Norse discovery of America. Penguin Classics. p. 28. ISBN 978-0-14-044154-3. Retrieved 15 April 2010. ^ "Зацепились за Моржовец" (in Russian). Русское географическое общество. 2012. Retrieved 5 March 2012. ^ Tibbets, Gerald Randall (1979). A Comparison of Medieval Arab Methods of Navigation with Those of the Pacific Islands. Coimbra. ^ a b "A History of Navigation". History. BBC. Retrieved 13 September 2013. ^ Jenkins, Simon (1992). "Four Cheers for Geography". Geography. 77 (3): 193–197. JSTOR 40572190. ^ "International Hydrographic Organization". 15 March 2013. Retrieved 14 September 2013. ^ Weyl, Peter K. (1970). Oceanography: an introduction to the marine environment. John Wiley & Sons. p. 49. ISBN 978-0-471-93744-9. ^ "Underwater Exploration - History, Oceanography, Instrumentation, Diving Tools and Techniques, Deep-sea Submersible Vessels, Key Findings in Underwater Exploration, Deep-sea pioneers". Science Encyclopedia. Net Industries. Retrieved 15 September 2013. ^ "Jacques Piccard: Oceanographer and pioneer of deep-sea exploration". The Independent. 5 November 2008. Retrieved 15 September 2013. ^ Cameron, James. "The expedition". Deepsea Challenge. National Geographic. Archived from the original on 14 September 2013. Retrieved 15 September 2013. ^ Logico, Mark G. (8 April 2006). "Navy Chief Submerges 2,000 Feet, Sets Record". America's Navy. United States Navy. Retrieved 12 September 2013. ^ "The Marvelous Mirs". Ocean Explorer. National Oceanic and Atmospheric Administration. Retrieved 5 July 2013. ^ "Marine and Coastal: Bathymetry". Geoscience Australia. Retrieved 25 September 2013. ^ "Research topics". Scripps Institution of Oceanography. Retrieved 16 September 2013. ^ "Research". The South African Association for Marine Biological Research. 2013. Retrieved 20 September 2013. ^ "Research at Sea". National Oceanography Centre. 2013. Retrieved 20 September 2013. ^ a b c "The United Nations Convention on the Law of the Sea (A historical perspective)". United Nations Division for Ocean Affairs and the Law of the Sea. Retrieved 8 May 2013. ^ "Introduction to IMO". International Maritime Organization. 2013. Retrieved 14 September 2013. ^ D'Amato, Raphaelo; Salimbeti, Andrea (2011). Bronze Age Greek Warrior 1600–1100 BC. Oxford: Osprey Publishing Company. p. 24. ISBN 978-1-84908-195-5. ^ Strauss, Barry (2004). The Battle of Salamis: The Naval Encounter That Saved Greece—and Western Civilization. Simon and Schuster. p. 26. ISBN 978-0-7432-4450-3. ^ Fremont-Barnes, Gregory; Hook, Christa (2005). Trafalgar 1805: Nelson's Crowning Victory. Osprey Publishing. p. 1. ISBN 978-1-84176-892-2. ^ Sterling, Christopher H. (2008). Military communications: from ancient times to the 21st century. ABC-CLIO. p. 459. ISBN 978-1-85109-732-6. The naval battle of Tsushima, the ultimate contest of the 1904–1905 Russo-Japanese War, was one of the most decisive sea battles in history. ^ Campbell, John (1998). Jutland: An Analysis of the Fighting. Lyons Press. p. 2. ISBN 978-1-55821-759-1. ^ Simpson, Michael (2004). A life of Admiral of the Fleet Andrew Cunningham: A Twentieth-century Naval Leader. Routledge. p. 74. ISBN 978-0-7146-5197-2. ^ Crocker III, H. W. (2006). Don't Tread on Me: A 400-Year History of America at War. Three Rivers Press (Crown Forum). pp. 294–297, 322, 326–327. ISBN 978-1-4000-5364-3. ^ Thomas, Evan (2007). Sea of Thunder. Simon and Schuster. pp. 3–4. ISBN 978-0-7432-5222-5. ^ Helgason, Guðmundur. "Finale". Uboat.net. Retrieved 13 September 2013. ^ Preston, Diana (2003). Wilful Murder: The Sinking of the Lusitania. Black Swan. pp. 497–503. ISBN 978-0-552-99886-4. ^ Bennett, William J (2007). America: The Last Best Hope, Volume 2: From a World at War to the Triumph of Freedom 1914–1989. Nelson Current. p. 301. ISBN 978-1-59555-057-6. ^ "Q&A: Trident replacement". BBC News. 22 September 2010. Retrieved 15 September 2013. ^ "Submarines of the Cold War". California Center for Military History. Archived from the original on 28 July 2012. Retrieved 15 September 2013. ^ Public Record Office (1860). Calendar of state papers, domestic series, of the reign of Charles II: preserved in the state paper department of Her Majesty's Public Record Office, Volume 1. Longman, Green, Longman & Roberts. ^ Newman, Jeff. "The Blue Riband of the North Atlantic". Great Ships. Retrieved 11 September 2013. ^ Smith, Jack (1985). "Hales Trophy, won in 1952 by SS United States remains at King's Point as Challenger succumbs to the sea". Yachting (November): 121. ^ Norris, Gregory J. (1981). "Evolution of cruising". Cruise Travel (December): 28. ^ "No evidence to support Foreign Minister Bob Carr's economic migrants claims". ABC News. 15 August 2013. Retrieved 21 August 2013. ^ Shaw, Ian (2003). The Oxford History of Ancient Egypt. Oxford University Press. p. 426. ISBN 978-0-19-280458-7. ^ Curtin, Philip D. (1984). Cross-Cultural Trade in World History. Cambridge University Press. pp. 88–104. ISBN 978-0-521-26931-5. ^ Kubetzek, Kathrin; Kant, Karo (2012). The Atlantic Slave Trade: Effects on Africa. GRIN Verlag. p. 1. ISBN 978-3-656-15818-9. ^ Halpern, Benjamin S.; Walbridge, Shaun; Selkoe, Kimberly A.; et al. (2008). "A global map of human impact on marine ecosystems" (PDF). Science. 319 (5865): 948–952. Bibcode:2008Sci...319..948H. doi:10.1126/science.1149345. PMID 18276889. ^ "Trade routes". World Shipping Council. Retrieved 25 April 2013. ^ Roach, John (17 September 2007). "Arctic Melt Opens Northwest Passage". National Geographic. Retrieved 17 September 2013. ^ "Global trade". World Shipping Council. Retrieved 25 April 2013. ^ Joint Chief of Staff (31 August 2005). "Bulk cargo" (PDF). Department of Defense Dictionary of Military and Associated Terms. Washington DC: Department of Defense. p. 73. Retrieved 24 April 2013. ^ Reed Business Information (22 May 1958). "Fork lift trucks aboard". News and Comments. New Scientist. 4 (79): 10. ^ a b Sauerbier, Charles L.; Meurn, Robert J. (2004). Marine Cargo Operations: a guide to stowage. Cambridge, Md: Cornell Maritime Press. pp. 1–16. ISBN 978-0-87033-550-1. ^ "Freight forwarder". Random House Unabridged Dictionary. Random House. 1997. Retrieved 24 April 2013. ^ a b c d e f g The State of World Fisheries and Aquaculture 2012 (PDF). FAO Fisheries and Aquaculture Department. 2012. ISBN 978-92-5-107225-7. Retrieved 23 April 2013. ^ "Fisheries: Latest data". GreenFacts. Retrieved 23 April 2013. ^ a b Myers, R. A.; Worm, B. (2003). "Rapid worldwide depletion of predatory fish communities". Nature. 423 (6937): 280–83. Bibcode:2003Natur.423..280M. doi:10.1038/nature01610. PMID 12748640. ^ Evans, Michael (3 June 2011). "Fishing". The Earth Times. Retrieved 23 April 2013. ^ a b Cabral, Reniel B.; et al. (April 2018). "Rapid and lasting gains from solving illegal fishing". Nature Ecology & Evolution. 2 (4): 650–658. doi:10.1038/s41559-018-0499-1. PMID 29572526. ^ Béné, C.; Macfadyen, G.; Allison, E. H. (2007). Increasing the contribution of small-scale fisheries to poverty alleviation and food security. Fisheries Technical Paper. No. 481. FAO. ISBN 978-92-5-105664-6. Retrieved 24 April 2013. ^ "About shrimp farming". Shrimp News International. Archived from the original on 1 February 2010. Retrieved 25 April 2013. ^ "Sea cucumber ranching improves livelihoods". WorldFish. Retrieved 25 April 2013. ^ Anderson, Genny (15 June 2009). "Lobster mariculture". Marine Science. Retrieved 25 April 2013. ^ Winterman, Denise (30 July 2012). "Future foods: What will we be eating in 20 years' time?". BBC. Retrieved 24 April 2013. ^ "Samphire". BBC: Good Food. Retrieved 24 April 2013. ^ "An Overview of China's Aquaculture", p. 6. Netherlands Business Support Office (Dalian), 2010. ^ Black, K. D. (2001). "Mariculture, Environmental, Economic and Social Impacts of". In Steele, John H.; Thorpe, Steve A.; Turekian, Karl K. (eds.). Encyclopedia of Ocean Sciences. Academic Press. pp. 1578–84. doi:10.1006/rwos.2001.0487. ISBN 9780122274305. ^ "The voice of the recreational marine industry worldwide". International Council of Marine Industry Associations. 2013. Retrieved 25 April 2013. ^ "Yachting". YachtingMagazine.com. Retrieved 17 September 2013. ^ Cater, Carl; Cater, Erlet (2007). Marine Ecotourism: Between the Devil and the Deep Blue Sea. CABI. p. 8. ISBN 978-1-84593-260-2. ^ "Health Benefits of Sea Bathing". MedClick. Retrieved 4 July 2013. ^ "The disciplines of windsurfing". World of Windsurfing. 15 April 2013. Retrieved 4 July 2013. ^ "Water skiing disciplines". ABC of Skiing. Retrieved 4 July 2013. ^ Catelle, W. R. (1907). "Methods of Fishing". The Pearl: Its Story, Its Charm, and Its Value. J. B. Lippincott. p. 171. ^ a b US Navy Diving Manual, 6th revision (PDF). US Naval Sea Systems Command. 2006. Retrieved 14 October 2018. ^ a b "Ocean Energy". Ocean Energy Systems. 2011. Retrieved 5 July 2013. ^ Cruz, João (2008). Ocean Wave Energy – Current Status and Future Perspectives. Springer. p. 2. ISBN 978-3-540-74894-6. ^ US Department of the Interior (May 2006). "Ocean Current Energy Potential on the U.S. Outer Continental Shelf" (PDF). Archived from the original (PDF) on 16 May 2011. Retrieved 8 May 2013. ^ Ponta, F. L.; Jacovkis, P. M. (2008). "Marine-current power generation by diffuser-augmented floating hydro-turbines". Renewable Energy. 33 (4): 665–673. doi:10.1016/j.renene.2007.04.008. ^ "Offshore Wind Power 2010". BTM Consult. 22 November 2010. Archived from the original on 30 June 2011. Retrieved 25 April 2013. ^ Environmental and Energy Study Institute (October 2010). "Offshore Wind Energy" (PDF). Retrieved 8 May 2013. ^ Tillessen, Teena (2010). "High demand for wind farm installation vessels". Hansa International Maritime Journal. 147 (8): 170–171. ^ "Cooling power plants". World Nuclear Association. 1 September 2013. Retrieved 14 September 2013. ^ Nurok, G. A.; Bubis, I. V. (1970–1979). "Mining, Undersea". The Great Soviet Encyclopedia (3rd ed.). Retrieved 6 May 2013. ^ Kohl, Keith (2013). "Underwater Mining Companies". Wealth Daily. Retrieved 6 May 2013. ^ Miner, Meghan (1 February 2013). "Will Deep-sea Mining Yield an Underwater Gold Rush?". National Geographic. Retrieved 6 May 2013. ^ Lamb, Robert (2011). "How offshore drilling works". HowStuffWorks. Retrieved 6 May 2013. ^ Horton, Jennifer (2011). "Effects of offshore drilling: energy vs. environment". HowStuffWorks. Retrieved 6 May 2013. ^ Milkov, A. V. (2004). "Global estimates of hydrate-bound gas in marine sediments: how much is really out there?". Earth-Science Reviews. 66 (3–4): 183–197. Bibcode:2004ESRv...66..183M. doi:10.1016/j.earscirev.2003.11.002. ^ Achurra, L. E.; Lacassie, J. P.; Le Roux, J. P.; Marquardt, C.; Belmar, M.; Ruiz-del-solar, J.; Ishman, S. E. (2009). "Manganese nodules in the Miocene Bahía Inglesa Formation, north-central Chile: petrography, geochemistry, genesis and palaeoceanographic significance". Sedimentary Geology. 217 (1–4): 128–130. Bibcode:2009SedG..217..128A. doi:10.1016/j.sedgeo.2009.03.016. ^ "Diamonds". Geological Survey of Namibia. Ministry of Mines and Energy. 2006. Retrieved 26 September 2013. ^ "Chemistry: Mining the Sea". Time. 15 May 1964. Retrieved 25 April 2013. ^ Al-Weshah, Radwan A. (2000). "The water balance of the Dead Sea: an integrated approach". Hydrological Processes. 14 (1): 145–154. Bibcode:2000HyPr...14..145A. doi:10.1002/(SICI)1099-1085(200001)14:1<145::AID-HYP916>3.0.CO;2-N.
^ Hamed, Osman A. (2005). "Overview of hybrid desalination systems – current status and future prospects". Desalination. 186 (1–3): 207–214. CiteSeerX 10.1.1.514.4201. doi:10.1016/j.desal.2005.03.095. ^ "Toxic Pollution". Ocean Briefing Book. SeaWeb. Retrieved 23 April 2013. ^ Ansari, T. M.; Marr, L. L.; Tariq, N. (2004). "Heavy metals in marine pollution perspective: a mini review". Journal of Applied Sciences. 4 (1): 1–20. Bibcode:2004JApSc...4....1.. doi:10.3923/jas.2004.1.20. ^ Barnes, D. K. A.; Galgani, Francois; Thompson, Richard C.; Barlaz, Morton (2009). "Accumulation and fragmentation of plastic debris in global environments". Philosophical Transactions of the Royal Society. 364 (1526): 1985–1998. doi:10.1098/rstb.2008.0205. PMC 2873009. ^ Karl, David M. (199). "A sea of change: biogeochemical variability in the North Pacific subtropical gyre". Ecosystems. 2 (3): 181–214. doi:10.1007/s100219900068. JSTOR 3658829. ^ Lovett, Richard A. (2 March 2010). "Huge Garbage Patch Found in Atlantic too". National Geographic. Retrieved 10 July 2013. ^ Moore, Charles James (2008). "Synthetic polymers in the marine environment: a rapidly increasing, long-term threat". Environmental Research. 108 (2): 131–139. Bibcode:2008ER....108..131M. doi:10.1016/j.envres.2008.07.025. PMID 18949831. ^ a b "Marine problems: Pollution". World Wildlife Fund. Retrieved 21 April 2013. ^ "How Does the BP Oil Spill Impact Wildlife and Habitat?". National Wildlife Federation. Retrieved 22 April 2013. ^ American Chemical Society (9 April 2013). "Gulf of Mexico Has Greater-Than-Believed Ability to Self-Cleanse Oil Spills". Science Daily. Retrieved 22 April 2013. ^ Dell'Amore, Christine (12 April 2013). "New Diseases, Toxins Harming Marine Life". National Geographic Daily News. National Geographic. Retrieved 23 April 2013. ^ Jefferies, D. F.; Preston, A.; Steele, A. K. (1973). "Distribution of caesium-137 in British coastal waters". Marine Pollution Bulletin. 4 (8): 118–122. doi:10.1016/0025-326X(73)90185-9. ^ Tsumunea, Daisuke; Tsubonoa, Takaki; Aoyamab, Michio; Hirosec, Katsumi (2012). "Distribution of oceanic 137–Cs from the Fukushima Dai-ichi Nuclear Power Plant simulated numerically by a regional ocean model". Journal of Environmental Radioactivity. 111: 100–108. doi:10.1016/j.jenvrad.2011.10.007. PMID 22071362. ^ "London Convention and Protocol". International Maritime Organization. Retrieved 15 September 2012. ^ "International Convention for the Prevention of Pollution from Ships (MARPOL 73/78)". International Maritime Organization. Retrieved 15 September 2012. ^ "Environmental, social and cultural settings of the Surin Islands". Sustainable Development in Coastal Regions and Small Islands. UNESCO. Retrieved 7 September 2013. ^ "Samal – Orientation". Countries and Their Cultures. Retrieved 7 September 2013. ^ Langenheim, Johnny (18 September 2010). "The last of the sea nomads". The Guardian. Retrieved 7 September 2013. ^ Ivanoff, Jacques (1 April 2005). "Sea Gypsies of Myanmar". National Geographic. Retrieved 7 September 2013. ^ Hovelsrud, G. K.; McKenna, M.; Huntington, H. P. (2008). "Marine Mammal Harvests and Other Interactions with Humans". Ecological Applications. 18 (2 Suppl): S135–47. doi:10.1890/06-0843.1. JSTOR 40062161. PMID 18494367. ^ "Traditional Owners of the Great Barrier Reef". Great Barrier Reef Marine Park Authority. Retrieved 16 September 2013. ^ a b Westerdahl, Christer (1994). "Maritime cultures and ship types: brief comments on the significance of maritime archaeology". International Journal of Nautical Archaeology. 23 (4): 265–270. doi:10.1111/j.1095-9270.1994.tb00471.x. ^ The Bible (King James Version). 1611. pp. Job 41: 1–34. ^ Kerenyi, C. (1974). The Gods of the Greeks. Thames and Hudson. pp. 37–40. ISBN 978-0-500-27048-6. ^ Shunsen, Takehara (1841). Ehon Hyaku Monogatari (絵本百物語, "Picture Book of a Hundred Stories") (in Japanese). Kyoto: Ryûsuiken. ^ Pontoppidan, Erich (1839). The Naturalist's Library, Volume 8: The Kraken. W. H. Lizars. pp. 327–336. ^ Diamond, Jared (2005). Collapse. Penguin. p. 14. ISBN 978-0-14-027951-1. ^ a b Slive, Seymour (1995). Dutch Painting, 1600–1800. Yale University Press. pp. 213–216. ISBN 978-0-300-07451-2. ^ Johnson, Ken (30 July 2009). "When Galleons Ruled the Waves". New York Times. Retrieved 19 September 2013. ^ Wagner, Richard (1843). "An Autobiographical Sketch". The Wagner Library. Retrieved 24 April 2013. ^ Schwartz, Elliot S. (1964). The Symphonies of Ralph Vaughan Williams. University of Massachusetts Press. ASIN B0007DESPS. ^ Homer (translation by Rieu, D. C. H.) (2003). The Odyssey. Penguin. pp. xi. ISBN 978-0-14-044911-2. ^ Porter, John (8 May 2006). "Plot Outline for Homer's Odyssey". University of Saskatchewan. Retrieved 10 September 2013. ^ Basho, Matsuo. "A Selection of Matsuo Basho's Haiku". Greenleaf. Retrieved 27 April 2013. ^ Najder, Zdzisław (2007). Joseph Conrad: A Life. Camden House. p. 187. ^ "The Caine Mutiny". Pulitzer Prize First Edition Guide. 2006. Retrieved 25 May 2013. ^ Van Doren, Carl (1921). "Chapter 3. Romances of Adventure. Section 2. Herman Melville". The American Novel. Bartleby.com. Retrieved 21 August 2013. ^ Jung, Carl Gustav (1985). Dreams. Translated by Hull, R.F.C. Ark Paperbacks. pp. 122, 192. ISBN 978-0-7448-0032-6. ^ Lal, Ashwini Kumar (2008). "Origin of Life". Astrophysics and Space Science. 317 (3–4): 267–278. arXiv:0907.3552. doi:10.1007/s10509-008-9876-6. ^ Winchster, Simon (2010). Atlantic: A vast ocean of a million stories. London: Harper Press. pp. 354–356. ISBN 978-0-00-736459-6. Kindersley, Dorling (2011). Illustrated Encyclopedia of the Ocean. Dorling Kindersley. ISBN 978-1-4053-3308-5. Stow, Dorrik (2004). Encyclopedia of the Oceans. Oxford University Press. ISBN 978-0-19-860687-1.